How will the Antichrist get Israel to sign a peace treaty? One of our speakers was Alan Franklin, editor for The Free Press. He's a political reporter and newspaper editor in London, England and author of numerous books on a variety of spiritual subjects. Alan's a recognized expert on the European Union and is a dynamic conference speaker. 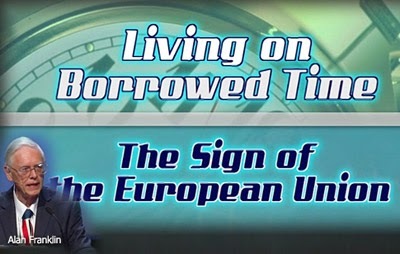 Alan Franklin' topic at our conference was "The Sign of the European Union" (watch). One of the keys to prophecy which we know is coming is the man who will become Antichrist. I believe he's already at large in the European Union at the moment. I don't think he's prominent yet, but I think he's out there. He's got to be ready, because this merger is going to happen very quickly. Everything is breaking down and coming together. We've got a world falling apart out there, but also a world that is very rapidly coming together. The world powers are huddling together, coalescing together, to become blocks of super states. We know from Daniel 7:26-27 that the man who will become Antichrist will sign a seven year peace treaty with Israel. If they already have Israel in their mold and under their control for being part of a Mediterranean Union, it will be very easy to guarantee Israel peace. The ground is being prepared for that treaty. The mission for Israel of the European Union is to finally be able to control Israel by making it do as it is told if it still wants to carry on trading. It's already very difficult for the Israeli's to trade with the rest of the world. Many countries boycott their produce, even in Britain, which is absolutely a massive population of Islamics. We've got about five million Islamics. Nearly 10% of the young population is Islamic in Britain. They boycott and blockade and picket stores that sell Israeli produce. My wife Pat and I always go around these stores and if we see anything from Israel we make a point of going up to the counter and saying, "We bought this because it's from Israel." We tell people that God blesses those who bless Israel. Nevertheless, Israel is going to come under increasing pressure to toe the line. Even right now there are discussions going on to create a free trade agreement between the EU and America. Once you have free trade you start to get free into changing populations. I've seen it all develop over many, many years. One of our newspapers that we published was a business newspaper. Several of our MEP's were columnists and they invited me out once in a while to listen into the debates and do some reporting and meet them. I saw firsthand right from the fairly early stages through the 80's and the 90's how the EU was actually developing into a massive power block. When you see what resources they've got and the people operating behind this move and the money that they have put into it, plus the expertise and the facilities they've got, you'll know that they are really meaning business. It's a powerful movement. There are 28 countries who make up the European Union as of the July 1, 2013. Their press gave me this sound bite: "We're a Union of peace, freedom, and solidarity." It sounds wonderful, for we all want peace. After World War II the European countries thought that if they all kind of merged together they couldn't wage war anymore. European nations for hundreds of years have waged war with each other. Britain fought a war with France for 100 years. We fought two World Wars with Germany. It seemed a very interesting and unusual idea — instead of waging war, we come together. That's how it was soft sold to the public. Croatia just joined the EU. Turkey which has 71 million Islamics is in talks right now, but they've been going on a long time because a lot of the EU nations don't want Turkey in because then all the Turks could come in and live in London or wherever. Bosnia, Serbia, Kosovo and even Iceland are known as candidate countries. In the third segment of Alan Franklin's message on the sign of the European Union, Alan discusses some of the methods the European Union uses to remove individual national identity. The Union for the Mediterranean (UfM) has existed for 5 years (July 2008) and its declarations and statues have been in effect for three years (March 2010). The UfM is an adjunct to the European Union, all the nations of which are members, and includes all of the nations of North Africa, except Libya which currently has observer status, as well as all the nations of the Levant, namely Israel, Lebanon, Jordan, Syria and Turkey, as full members. The UfM has a North-South division within it, and this is reflected with the North-South UfM co-presidency which guarantees co-ownership of the UfM between the one of the EU countries and one of the Mediterranean partner countries as the presiding leadership of the UfM. Every two years the co-presidency shifts to a different country within the North-South axis. Currently the co-presidency is held by the EU and the Kingdom of Jordan. It seems to me the the "covenant among many," which the Antichrist will confirm at the start of the 70th Week, may well be a more robust treaty for the UfM integration which reduces the amount of sovereignty exercised by the member states in international affairs in exchange for military defense against all nations which are external to the UfM. Thus the "peace treaty" is not specifically between Antichrist and Israel, but the EU and all of the member nations of the Mediterranean member states (i.e. "among many."). Notice how in Daniel 11 the EU Antichrist militarily subdues the Libyans and Egyptians, as well as Israel, but Jordan escapes his hand.